Atlanta Wedding & Event Professionals curates environments where collaboration and partnership opportunities abound! 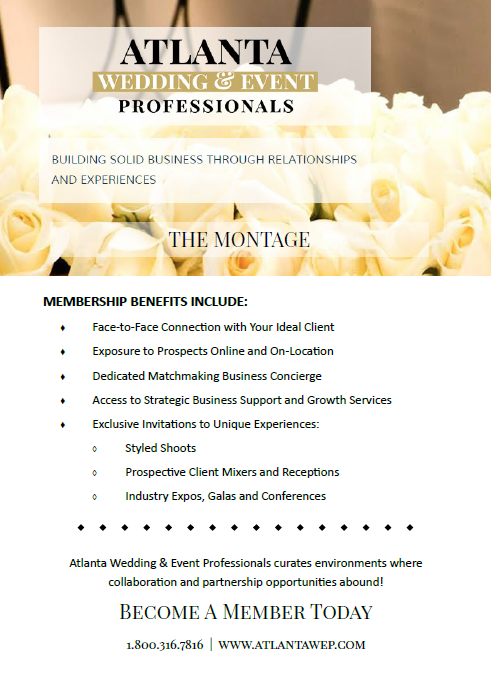 Includes your company Sales & PR Builder Live Event and all membership perks including entry into Mid-Week Mixers, partner benefits, bridal show discounts, AtlantaWEP website badge, mobile app listing, and more. Includes your company Sales Builder Live Event and all membership perks including entry into Mid-Week Mixers, partner benefits, bridal show discounts, and more.